This weekend is ANZAC Day and it is a time to remember all of the brave men and women who have made the ultimate sacrifice over the years to protect our way of living here in Australia. I read a newspaper article that got me thinking about how much animals have helped us along the way in all our human endeavours, including our conflicts. 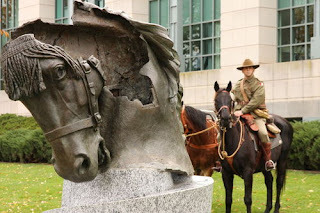 The article was about a new memorial for all the brave animals who have served with the Australian armed forces in overseas wars, past and present. The memorial honours guard dogs and cavalry horses of course, but also the other types of animals that have helped man in foreign wars. And of course, lets not forget the mascots that many platoons and companies keep. From bulldogs to cockatoos, from kangaroos to crocodiles, these mascots bring our fighting men and women some entertainment and comfort while far from home. 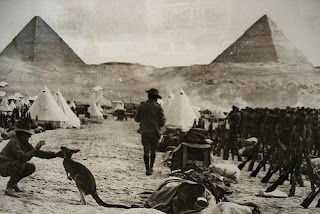 I love this World War I photo of Aussie troops with a Wallaby mascot in front of the pyramids. Regardless of what your view is on the rights or wrongs of a particular war (or war in general) there is no denying the bravery of the animals that work along-side our troops. If you are in the military or know someone who is and have a photo of a military mascot currently serving overseas, I'd love to see it, and if you let me, I'd be happy to post a copy on our blog. Click here to find an ANZAC Day service near you.